1. 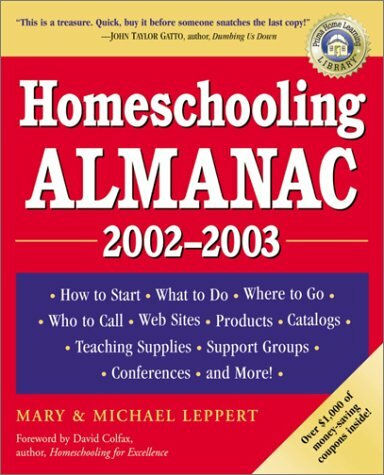 Homeschooling Almanac, 2002-2003: How to Start, What to Do, Where to Go, Who to Call, Web Sites, Products, Catalogs, Teaching Supplies, Support Groups, Conferences, and More! Whether you currently homeschool your child or are exploring the idea for the first time, this homeschooling bible is for you. Inside is the most up-to-date and complete information for homeschoolers available—all of the support you need to get started and customize the learning experience to your child's specific needs. I would not be without this book! I have to have this book!It has so much support and advice.It also has information on different state laws on homeschooling. I was completely disappointed when I purchased this book.Most of the information in it is out dated.The contact information for the homeschooling services was inaccurate.I wasted a lot of time looking up the correct phone numbers and web addresses for many of the companies listed.I think the authors shouldupdate their information or people are going to start thinking that they're just out to make a quick buck. This is a good resource book. As far as helping you individually in your homeschooling it's not a good book. But telling you were to go for help it is great. I rely on the reviews of others when I buy books. After reading one review listed here, I was concerned that the information would not be reliable.However, upon reviewing the NEW edition, I discovered that the authors have not only updated the legal and support sections, but have updated resource info and even the discount coupons included in the book. As an old-time homeschooler, I can say that this stuff changes in the homeschooling world almost daily, and the authors deserve credit for staying abreast of the latest legal news as well as the constantly changing homeschool support group information. A big round of applause is deserved for keeping the resources up-to-date too -- which also changes with the wind. My favorite parts of the book are the "typcial day" and "curriculum" sections. Everyone who has homeschooled for any length of time knows there is no such thing as a typical day or a typical curriculum.We also know everyone assumes that there is.The Lepperts have provided a glimpse into what a typical day and a typical curriculum might be like.They are careful to let the reader know that one-size-does-not-fit-all.That's exactly what makes homeschooling such a wonderful choice for so many square pegs who don't fit the round holes of traditional schooling.This is a MUST READ for anyone considering homeschooling -- and the coupons are a nice plus as the discounts they offer really do help pay for the cost of the book! While this book does have some helpful resources it's summations of the laws and support groups is out of date and incomplete. So let the buyer beware regarding those two issues. Benefit from the information in the rest of this book but most certainly do not rely on it to be an authority of homeschooling laws and support in the state in which you live. Do exactly as the authors indicate--check with local homeschoolers before you begin. You'll be better off finding those laws and groups via the internet than relying on this book.